Do you make bead art? This is a growing collection of articles of interest to beaders who make art and beaders who want to make art. Because the subject here is art, the articles are don't fit into some logical progression, but wander about in the realms of art processes, musings, and perhaps a few wacky ideas here and there. . . . If you a little obsessed with seed beads and what you can create with them in addition to jewelry, then you have come to the right place! Of course, if you just like to look at art created with beads, instead of making it yourself, you are welcome, too! I am loosely defining Seed Bead Art to include original pictorial or sculptural works created largely or completely with seed beads and also original one-of-a-kind wearable art, which in the world of seed beads is generally seed bead jewelry. 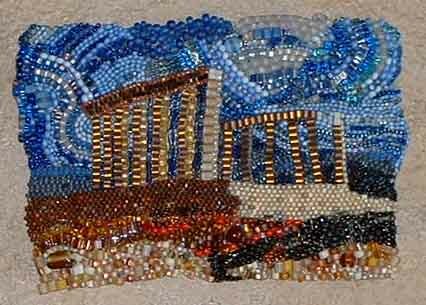 Creating Seed Bead Art in Brick Stitch provides a peek into the process I used to create a brick stitch image of Nut, the Egyptian Goddess of the Sky. I had been intrigued by images I had seen of this ancient deity, and had had the idea in the back of my mind to do something on this theme. When the image started to come together, it was obvious to me that it should be in beads. Six Ways to Learn from Coffee Table Beading Books. There are some beautiful books of beaded art. Some are catalogs from exhibitions, others are juried collections of photos. Although these books contain no instructions, and not very many words, they have a lot to teach us. Here are some strategies for learning from those gorgeous photographs. For ideas on framing your beadwork, several methods for mounting the bead art to a backing, suggestions for suitable backings, and strategies for inexpensive framing, you may want to take a look at this article. How to Mount and Finish Beadwork: A Teapot? 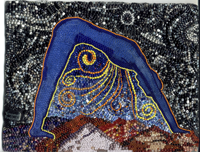 When you make beaded artwork, there is always the question of what to do with the beadwork when it is complete? Frame it? Mount it on a handbag? Here's a different way to use it! A teapot. Read about it and see it here. Your words of encouragement can mean a lot to an artist you know. Here are some stories about that very thing. A big bead stash can be delightful, or it can just weigh you down. Here are some ideas on buying -- and not buying -- more beads, particularly in service to developing a coherent body of art work.